Past it at 35? I don’t think so! Don’t you just love ageism? I love how Twitter helps make things actually happen. 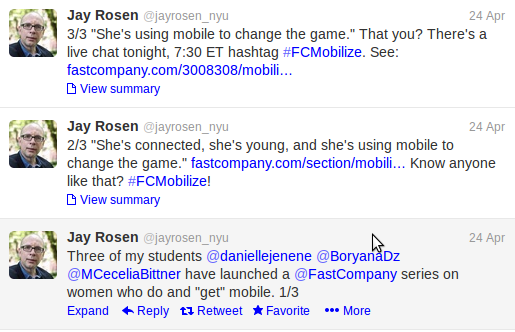 Last night Jay Rosen put out three tweets about a forum looking for young, networked women who are using mobile to change the world. I knew without following the link that, at 45, I didn’t fit the bill but I thought that Liz Azyan and Leah Lockhart fitted the bill perfectly so I tweeted then. Lo and behold when they checked it out one of them was too old at 35!